Recommended to: Young readers who enjoy fun, quirky stories with a lot of heart. My name is Amber Alessandra Leola Kimiko Miyamoto.I have no idea why my parents gave me all those hideous names but they must have wanted to ruin my life, and you know what? They did an amazing job. How do you resist a character like Amber Alessandra Leola Kimiko Miyamoto? Easy answer. You don't. I read the synopsis, fell in love with this half-Japanese, half-Italian little girl, and promptly added this to my reading list. I'm a big pusher of Middle Grade stories. Most specifically, I fully endorse any story that deals with diverse characters and real life situations. Dream On Amber hit all those points, and I couldn't wait to read it. 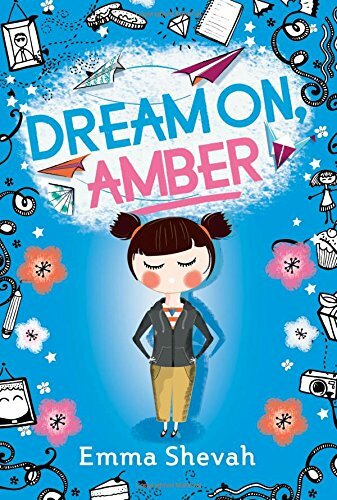 First off, I want to give a high five to Emma Shevah for writing such a wonderfully realistic eleven year old girl. As a person who worked with children for a huge chunk of my life, I always love to see a character who feels real. Amber impressed me to no end. Her love of art, but her fear of sharing that passion with others was spot on. Middle school is a scary place to begin, and setting yourself apart from others is difficult. Plus I absolutely loved the interaction between Amber and her little sister Bella. Anyone who has been a big sister knows that fine line we walk between annoyance and pure love for our little sisters. Amber and Bella felt like a real set of sisters, and I loved it. In fact, it was Amber's family life that really stole my heart. From her hardworking single mom, to her whimsical little sister, this group of characters came to life on the page. I think stories like this are important for Middle Graders. How many kids are there out there who are suffering from a dad shaped hole, just like Amber? How many of them wish they had someone to identify with? Plenty. Which is why I'm happy Dream On Amber is in existence. This is important stuff. So why the three star rating? Mostly, and I'm being completely honest, it's because I didn't identify with this story as a whole. There were a lot of parts that I enjoyed, Amber being the main attraction. However I also felt like there could have been a deeper exploration of her feelings. There's a quick look at some bullying, that kind of blends into the background. Amber's art is in the background, but never quite comes to the forefront. This is the perfect story for a young reader, I just didn't feel like it had the oomph to transcend past that age group. Still, this is a solid story that I'd highly recommend to any young readers. Especially those who might be missing a dad.